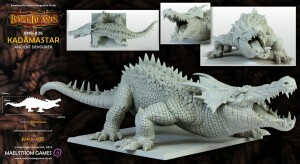 BaneLegions is now taking pre-orders for their huge Kadamastar kit. Order yours and be the first kid on your block with one! As you should all know by now, the first Friday of each month is BaneBeasts day, and as you should all know by now we have a superb one for you. When do we not?! Conceptualiserised by the sublime talents of Christophe Madura and sculpted up real good by the amazing Benoît Cosse – who, it seems, can turn his hand to just about anything we give him – Kadámastar is quite fantastic, we think, imbued with a sense of movement perhaps unequalled in our miniatures so far. You can almost feel those jaws biting you in half!